Bukich, who came off the bench to star in the 1953 Rose Bowl, was chosen by the Los Angeles Rams in the second round of the ’53 NFL draft. While he impressed with his strong passing arm, Bukich saw little action as a rookie and then went into the military for two years. He won a National Service Championship as quarterback for Fort Ord and then returned to the Rams in 1956, going back to the bench. After throwing 55 passes in two seasons in LA, Bukich was traded to Washington in 1957 and continued to be a little-used backup. He moved on to the Bears during the ’58 season and continued to sit before being dealt to Pittsburgh in a “lend-lease” arrangement. He sat behind Bobby Layne but, when the aging veteran was injured during 1961, Bukich saw his first extended action, starting seven straight games. After having thrown a total of 157 passes over six years, he tossed 156 and completed 89 (57.1 %) for 1253 yards and 11 TDs, and despite 16 interceptions, made a favorable impression. The Bears brought him back in 1962 as the “player to be named” in the original deal that sent him to Pittsburgh and he returned to a backup role behind Bill Wade, which continued during the ’63 NFL Championship season. With the team and Wade slumping in 1964, Bukich was inserted into the starting lineup and performed well before being sidelined by a shoulder separation. Bears went 5-9 to finish sixth in the NFL Western Conference while leading the league in passing yards (2841) – but ranking last in rushing yards (1166). 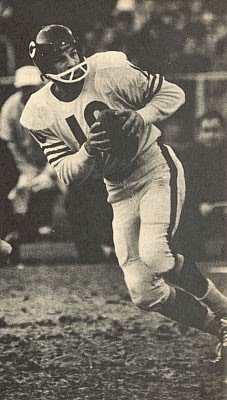 Bukich followed up with his finest season in 1965, leading the league in passing as he threw for 2641 yards and 20 touchdowns while giving up just 9 interceptions. The Bears went 9-5 but dropped back to a losing record in ’66. Bukich nearly reversed his TD-to-INT ratio, throwing for 10 touchdowns and being intercepted 21 times. He returned to a backup role for his last two seasons in 1967 and ’68. Overall, Bukich started just 41 games in the course of 14 seasons and passed for 8433 yards and 61 TDs with 74 interceptions. His most productive years came with the Bears, where he accounted for 6254 passing yards and 46 TD passes against 45 interceptions.